How do bigfoot cut down trees? Not trying to cool your enthusiasm but what you are pointing out is the variation between sound wood and rotten wood. Some of those are what you would call barber chair breaks. Very dangerous if you're cutting trees down. The big branch break can't be teeth marks because that part of the branch was totally enclosed in the rest of the tree before it broke. Some of those breaks even showed a white fungus on them. Also, if it were teeth that were doing the damage the bark at the break point wouldn't be intact. For an example look at how beavers chew into trees. As someone who has experienced many big trees fall down close by on perfectly calm days... It happens. Mostly due to natural causes. Just an aside, look for bullet holes. They create straight cuts through trees and weaken them in the process. I've seen large trees, 18" completely cut in two by bullet holes. Not trying to cool your enthusiasm but what you are pointing out is the variation between sound wood and rotten wood. Some of those are what you would call barber chair breaks. Very dangerous if you're cutting trees down. The big branch break ﻿can't be teeth marks because that part of the branch was totally enclosed in the rest of the tree before it broke. Some of those breaks even showed a white fungus on them. Also, if it were teeth that were doing the damage the bark at the break point wouldn't be intact. For an example look at how beavers chew into trees. Those are not chainsaw cuts at all. And in many cases the wood is not brittle or rotten. The one I showed is just a very old tree with the similar cut marks. Like I said in the video I think it's more about tools and not teeth. Most of these, as well as others that I did not show on this video, take place way out where nobody goes and there's certainly no urban chainsaw cutting going on. Something is out there using a tool to cut down some trees. Then they get dragged around and stacked, or in other cases they get leaned up against other trees. I didn't mention chainsaws. The point that I was trying to make is that they all appear to be natural breaks. Wood rots in stages, it may be hard yet but the fibers are still breaking down and weakening the tree. You can see the horizontal checks in some of those pictures you took. Those are natural fracture points. I would make a suggestion: on one of those trees that can be reached from the ground. Cut a portion of the break out and see if it fits into the opposite side of the break. If they fit together, kind of like a jigsaw puzzle then there probably weren't any tools involved. Just natural checking. Just suggesting a way to research the situation and not make assumptions. In most of these cases, the other part of the tree--like a jigsaw puzzle--is very near the tree I was examining. Just eyeballing it and they do look like they fit together. In some of the cases, and I wish I would have put more focus on these, there are scraped pieces of bark around the cutting areas and what appear to be fingernail marks that scrape around the outer edge of the break, as if a tool is being dragged around the tree in a cutting motion. There is a view of this in one of the last portions of my video but I am going work on this in the future to get more details and pictures of these when I see them again. I would say the chances that a BF chews on trees to help knock them down is zero. Their heads and teeth are just not designed for that type of work. If BFs are involved, I would say they knock down partially dead trees with brute force and then chew on any grubs and fungus that they find inside them. BTW, have you seen any hairs in your inspections of the trees? If a BF was chewing on them, I would think there would be lots of hair snagged from their face and hands on those sharps edges. I got this idea because I might have seen a small hair in the center of the log when you do a close up pause at the 4:50 mark. I think what TD-40 is talking about is not teeth. Instead it seems the reference is to perhaps a sharp edged stone that is being used as a kind of horizontal tool to cut or chop into the tree and weaken it enough to then break it with brute force. TD-40, is that close to what you are trying to investigate? When I first started seeing these trees that truly appear to have been cut, way out in the middle of nowhere and without chainsaw marks and in the middle of other sasquatch sign, I thought that bigfoot were using their teeth. But as I explained in the video description, I found some videos on YT that show apes and gorillas using 'tools' for various tasks, some of them acting as blunt instruments to crack open something. Well, if bigfoot are part primate and have a higher intelligence, it is not outside the realm of possibility that they, too, may be using tools for certain tasks which could include large projects such as downing trees. That's when I shifted my opinion to tools instead of teeth. The pattern of cut is often very consistent as if it is standard practice among them to use the same type of tools and techniques. I still don't know reasons why they are cutting down trees and even uprooting others. That's an entirely different discussion. Going back on my memory I do recall seeing what look like fingernail or some type of scrapes going around the perimeter of some of these downed trees that could suggest a universal technique or tool that may be used. I'm going to put more focus on this when I find them. I just attached a photo of one of these trees and you can see the scrapes near the bottom of the picture. I want to look at these more closely next time. 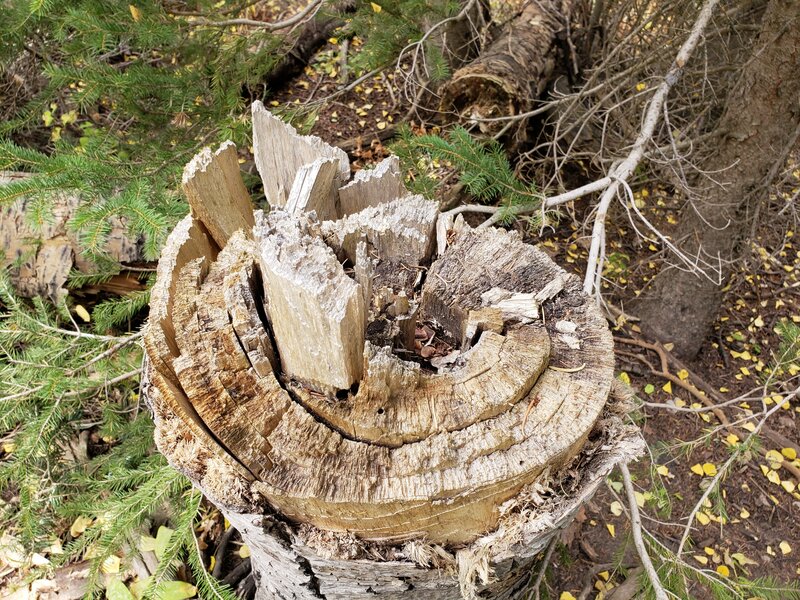 When trees break and fall, part of the wood has compression failure and the material on the opposite side has tension failure. I am in densely forested areas where the trees have shallow root structure. They are not healthy. Dangerous areas in a wind storm. They simply fall over. There is a constant rain of debris from the over story down to the forest floor. I am wandering around and tree branches break off. Some hit the ground and some hang up in tree limbs. Also, is the Forest/Park Service thinning trees? Kill a tree with a 'girdling tool'. No fussing around. Tree dies, falls over and returns nutrients back to soil. I would suggest using big pieces of hook & loop fabric (Velcro) to pat around for hairs to check for mouth/face & limb contact. I see those marks but without close actual inspection of the tree it's hard to tell what they are or what made them. If as you say a sawing motion was used the marks at the break would be perpendicular to the center of the tree, not parallel as the picture clearly shows. The only way you could get a mark in that direction is with a very small chisel-like tool, driven horizontally into the trunk. Even with that you could tell that's what it was. Not corrugations as clearly seen there. So are we now saying that bigfoot is using some kind of incredible tool that leaves marks different from an axe, saw or chisel? Regardless if you use stone or metal tools they leave very distinctive tool marks. I would also suggest finding some trees that are broken in the area showing no rot but rather firm sound wood. You will probably find they are a mass of splinters. Do they only do that to dead or dying trees? In the image it does look like the fallen section that came off that stump is just to the right of center at the top of the pic. As a suggestion to help your hypothesis and investigations perhaps look around and see if there are any 'tool-use' candidates lying close by? Something with a sharp tapered edge maybe that has a good purchase area for grabbing onto? Maybe axe head-like or at least wedge-shaped with a fairly sharp edge. If so than use it to possibly match up with different locations around the tree stump. This is just my opinion but I believe that they climb the tree to the highest point and swing it until it breaks and t6hen they use it. Does this make sense ? I've seen bears do the same but with smaller trees. But if this is the case then they are simply breaks.